Capitol Hill Books, located four blocks from the Capitol Building, is a quick 30-minute trip on the orange line. With a full course load and the busyness of a new semester, it can be hard to find a time and place to escape the chaos. Losing yourself in one of the District’s many bookstores will help pass the time on a relaxing Saturday or provide a nice break from studying during the week. Instead of dense readings for your required classes, you can pick up an easy read on a subject you’re passionate about at one of the tiny book stores that dot the map. Capitol Hill Books, located four blocks from the Capitol Building, is a quick 30-minute trip on the orange line. With a weathered, off-white awning and stacks of aged books covering the windows, even from the outside this bookstore looks unique from all the rest. The inside has floor-to-ceiling stacks of books lining the narrow hallways, creating a labyrinth of novels. The bookstore houses an impressive collection of used books, with particular importance seemingly placed on politics and government. Book prices range from Darwin’s “Origin of Species” costing only $5 to first editions upstairs priced at $120. Adding to the charm of the store are the handwritten, and often times humorous, signs lecturing patrons on proper bookstore behavior. In front of a stack of books about Republican politicians, a sign warns customers not to look into the people’s eyes because they’ll turn to stone. Another quirk of the store is the bathroom, which also doubles as the foreign language section. Capitol Hill Books has a three-level design, with the first floor housing a small cash register almost lost in the stacks of books. The basement’s low ceilings and dim lighting form an almost secretive atmosphere with a soft track of classical music playing in the background. 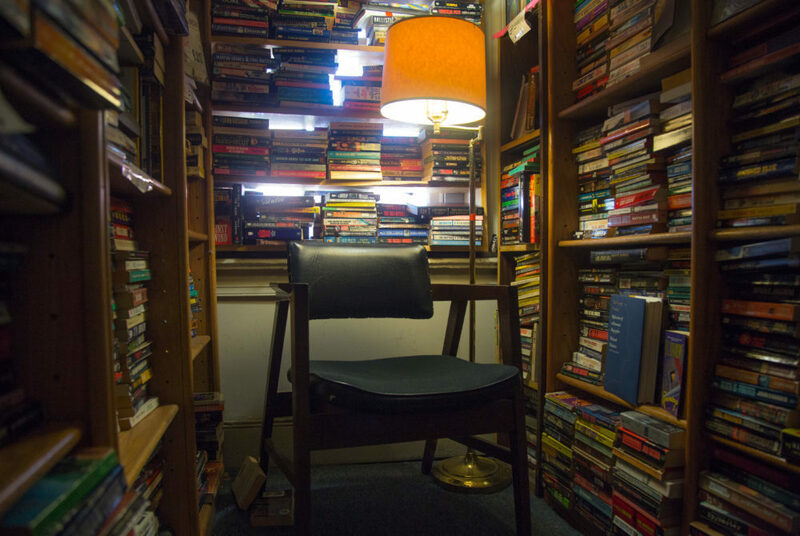 Up a narrow staircase, the second floor is also packed with books and has a handful of chairs throughout. Bridge Street Books, located at 2814 Pennsylvania Ave. in Georgetown, is a 20-minute walk from the Foggy Bottom Metro station. 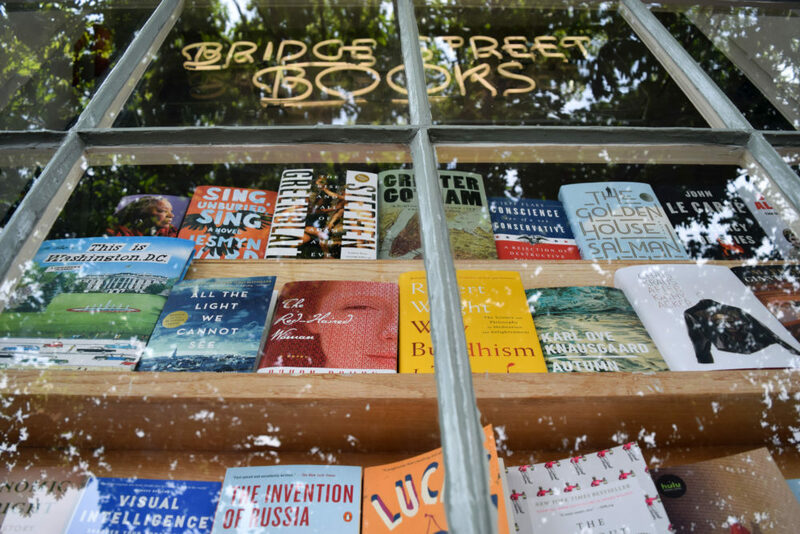 Bridge Street Books, located at 2814 Pennsylvania Ave. in Georgetown, is a 20 minute walk from the Foggy Bottom Metro station. The shop fits the classic image of a bookstore, with a two-story building cramped with books, giving a cozy feeling to each customer. Make your way around the loft of the second floor overlooking the shelves below — with sections of cultural theory, hardcover fiction, American history, eastern religion and literature — to discover anthologies of the New Yorker or collections of Jane Austen. The quiet atmosphere makes Bridge Street Books a great place to forget about the busy city outside, but limited space for lounging means you might want to grab your book and go. 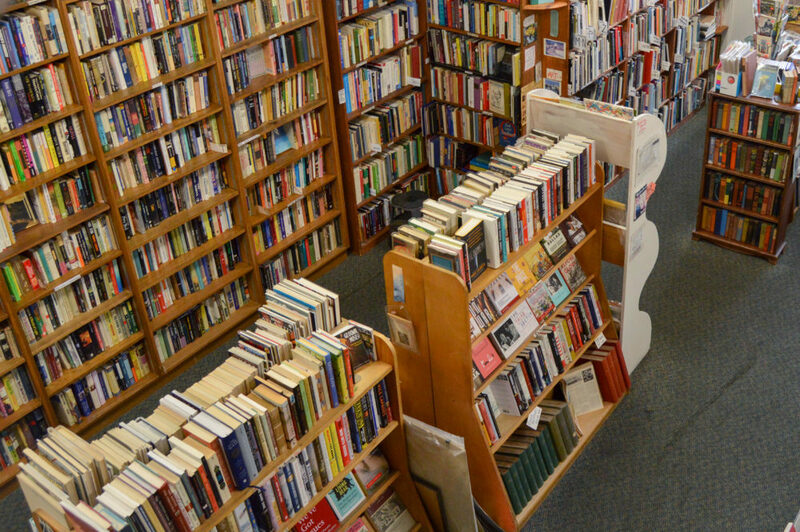 Step out of the Woodley Park-Zoo Metro station, and after a quick 15-minute walk down Calvert Street, you’ll run into Idle Time Books. Step out of the Woodley Park-Zoo Metro station, and after a quick 15-minute walk down Calvert Street, you’ll run into Idle Time Books. The bookstore’s lime green exterior serves as a stark contrast to the beige buildings that surround it, but fits right in with the neon lights of the countless bars that line the street. The bookstore specializes in used books with shockingly affordable prices – most of the books are half off the ticket price, starting at $3. Idle Time Books also houses an impressive collection of almost 100 first editions that can cost up to $400 locked away in a glass case by the cash register. Browsing the bookstore, customers are reminded not to use their cell phones with small handwritten signs depicting caricatures obnoxiously using their phones located on walls and bookshelves throughout the store. The same signs direct readers to the store’s extensive collection of genres, ranging from fiction to practically any specialized subject area. A trip upstairs is an adventure on it’s own, with a different book placed on each step for a reader to pick up and examine. Posters seem to be another specialty of the store, with panoramas of D.C. and depictions of scenes from old movies priced at about $20. Idle Time Books hosts other unusual buys, like vintage science fiction pulps for $5, copies of uncorrected proofs and even a small box of old playbill pamphlets for $1 each. 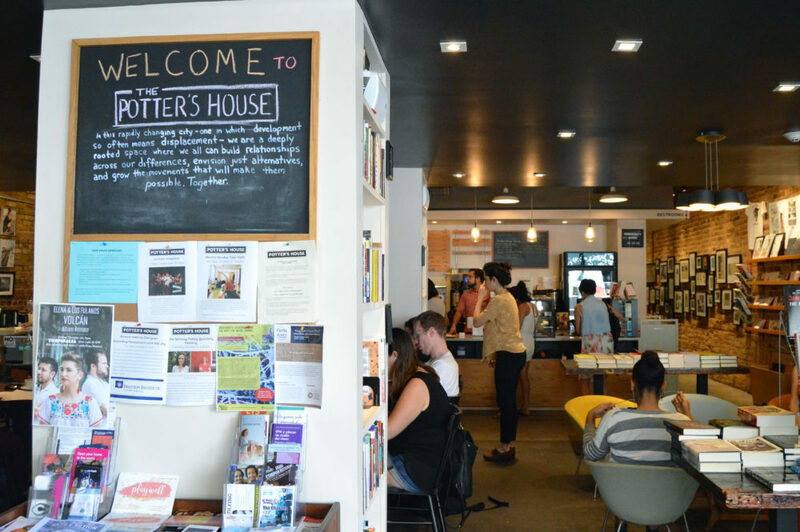 An easy ride along the yellow or green line brings you to The Potter’s House, a trendy, cozy bookstore in Adams Morgan. An easy ride along the yellow or green line brings you to this trendy, cozy bookstore in Adams Morgan. The Potter’s House, located at 1658 Columbia Road, fits in perfectly with the edgy vibe of the neighborhood. This cafe serves up unexpected twists on traditional coffee shop treats. On bookshelves alongside the exposed brick walls, the selection of new books is wide but not deep. With sections including health and wellness, ecology, food and movements and activism, there are plenty of intriguing options. The store offers both indoor and outdoor seating, including screen-free seats set aside specifically for those testing out a new novel without the distraction of phones. Signs on the tables that suggest sharing the seats with others add to the community aspect of the store that The Potter’s House advertises. The Potter’s House cafe has a weekday menu featuring hearty breakfast items like huevos rancheros ($10) or a breakfast sandwich with soft fried egg, heirloom tomato and arugula on baguette ($6). On the weekends, they offer expanded brunch and dinner menus. The Potter’s House is the perfect place to grab an iced tea or a staple sweet potato chocolate chip muffin and fall into a new book for the afternoon.